Want to diagnose your vehicles rapidly and conveniently in your own environment? In this case, focus on finding affordable, last-generation automotive diagnostic scan tools offering accurate repair information and unmatched coverage right at your vehicle. Some of the most modern models display a combination of innovative design, award-winning scan test software and wireless vehicle to PC connection. These diagnostic solutions are incredibly versatile and have been designed for both personal and professional use. 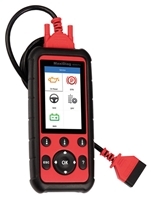 The RDT40 Basic Diagnostic Code Reader, RDT45 Digital Auto Scanner,, Autel AutoLink® AL519 OBDII/EOBD Scanner, Autel MV108 MaxiVideo Digital Inspection Camera, CarScan Diagnostic Tool™ are listed among our bestsellers, which can help you understand and address potential problems impacting the functionality of your vehicle. While browsing through our selection of automotive diagnostic tools, keep in mind that you could search by price and/or brand. We stock various types of diagnostic solutions introduced by world-class players in the automotive industry, such as Actron, Autel, AutoBoss, OTC, OTC Tools & Equipment and many others. We can give you the chance to choose the best scan tools based on your unique needs and budget. Whether you would like to invest in an affordable and reliable digital auto scanner that will fit in your pocket, go for a 5.5mm digital inspection camera or pay the lowest price for a high-end diagnostic scan tool that comes with a wide range of premium accessories, you should know that we have all these products in store for you. Spot and compare your favorites with just a few clicks and spend less on smart diagnostic tools that will find their place in your shop or garage.